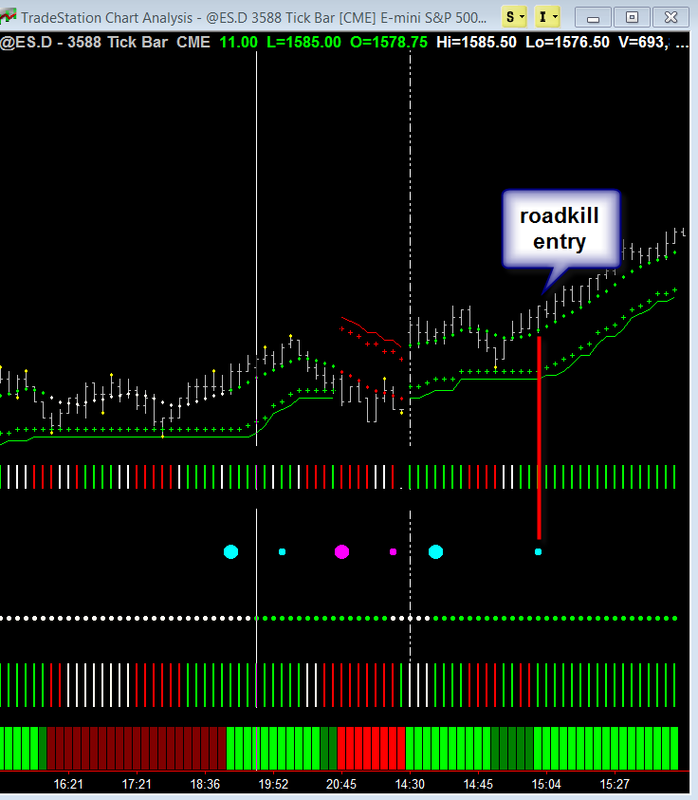 Trade of the Week – Understanding Roadkill, a Low Risk Entry. This week I want to review the basic setup I used for our trade of the week. Looking at the intraday ES market, we begin with the Hawkeye Gearbox – a unique indicator exclusive to Hawkeye Traders. Every trading day, the Gearbox calculates and gives us the exact tick speed to trade the market… so you are always trading in harmony with the market vibration. Shown in Chart 1 is a picture of the Gearbox. A great deal of technical analysis goes into every calculation… we do the heavy work for you, and display the results. Chart 1. The Hawkeye Gearbox is a unique indicator that gives us each day the tick speed to trade the market so you are always trading in harmony with the market vibration. From the Gearbox, we see 4 primary speeds to use throughout the trading day… ultrafast (aqua), fast (blue), normal (yellow), and slow (orange for futures/equities and red for Forex). 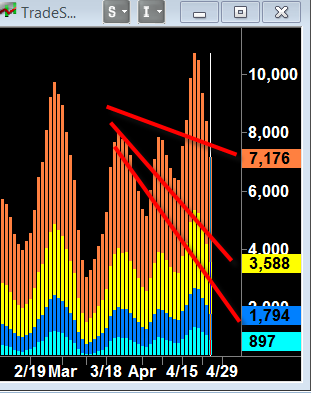 For today’s charts, I will refer to the yellow speed (3588 ticks) and the orange/red speed (7176 ticks), and you should see that my charts are set to these tick speed settings. Chart 2. Conservative Roadkill entry. The yellow time frame, which is the dominant time frame, shows a cyan dot below the red bar, indicting a Roadkill entry. I am often asked why it did not come sooner in the trend, but we are wanting trades where the risk is low, and therefore the close of a bar to trigger roadkill has to be greater than the open, and in the top 50% of the range. This condition occurred at the cyan dot, confirming our conservative entry. Without having to understand the full breadth of technical analysis behind the trade setup, the Hawkeye uses an intuitive color system to easily identify entries. When everything lines up, the entry is confirmed. Chart 3. The slow time fame should never be ignored. Always look at the orange/red time frame (the slowest) and never trade against it. It shows a pivot low (the yellow dot). A pivot will “push” the market up 85% of the time as we are in an established uptrend. 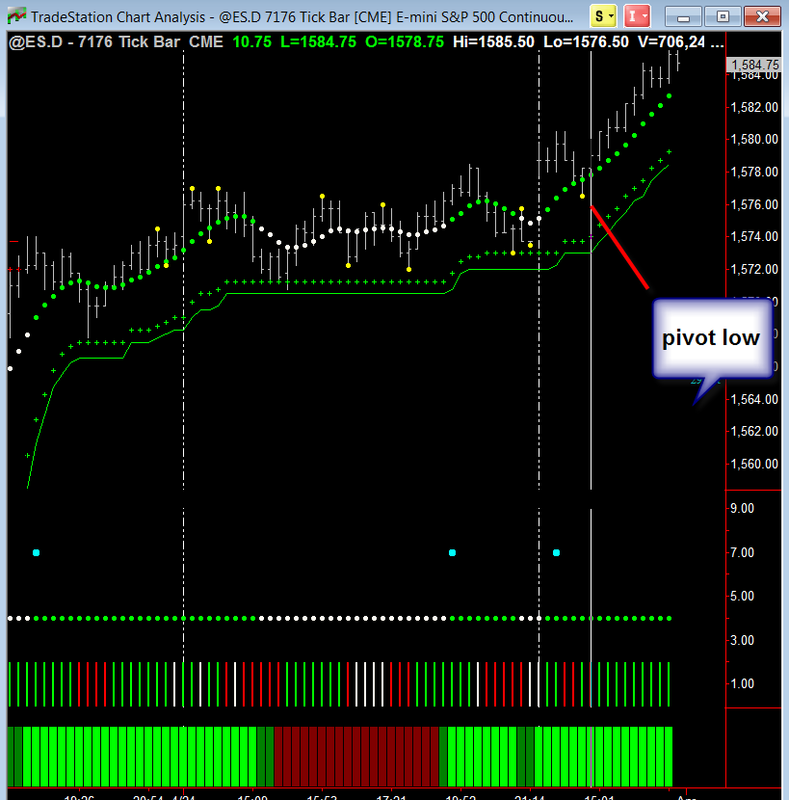 This indicates a pull back and reversal back into the dominant trend… which equals a low risk entry! Know your tools and trade with confidence. Next week, I will highlight and demonstrate where to take profits. Previous PostPrevious Everyone went crazy over Gold, but not Hawkeye! Next PostNext Three smart ways to exit a trade.